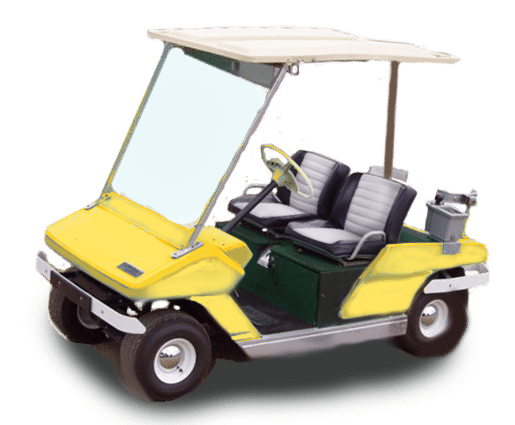 Cushman golf carts are rare and considered to be collector’s items now. Since manuals are scarce and most specs have been relegated to microfiche, it has been a chore in the past to dig up the answers to your questions about your Cushman golf cart year. What year is my Cushman golf cart? Your cart’s year is on the serial plate and is the first two digits of the last four numbers. This is a compiled list of available data to pinpoint your particular vehicle. You should have no problem identifying the model and year of your rare cart. 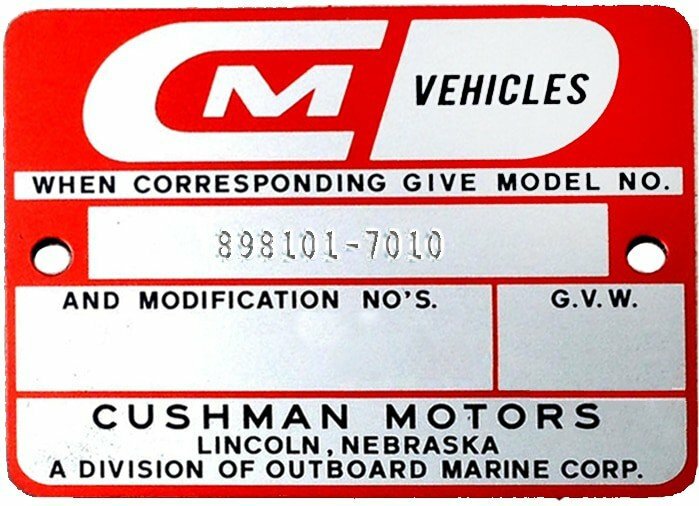 The Cushman Motor Company was established in 1901 in Lincoln, Nebraska, and after changing hands with several owners, ceased production of the golf cart in 1975. The crucial numbers found on the Cushman vehicles is the MODEL number and the SERIAL number. The Model Number is usually located under the seat on the driver side of the shift lever console. The number will look like the plate pictured and be riveted to the console. The number usually starts with an ‘8’, like 898100 or 880429. Checking this number on the chart below will show you all the different models Cushman made. Many were very similar in appearance, but the wiring schematics and engine types varied. Cushman Motor Company was, as the name implies, mainly in the business of building motors for farm equipment and industrial applications. 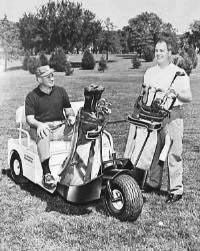 The first golf carts began rolling out in 1955 and continued until 1975 when it was decided to abandon the golf cart line in favor of the utility vehicle line and turf care products. The following chart has been pared down to focus on just the golf carts and leave out the people-movers and turf workhorses. 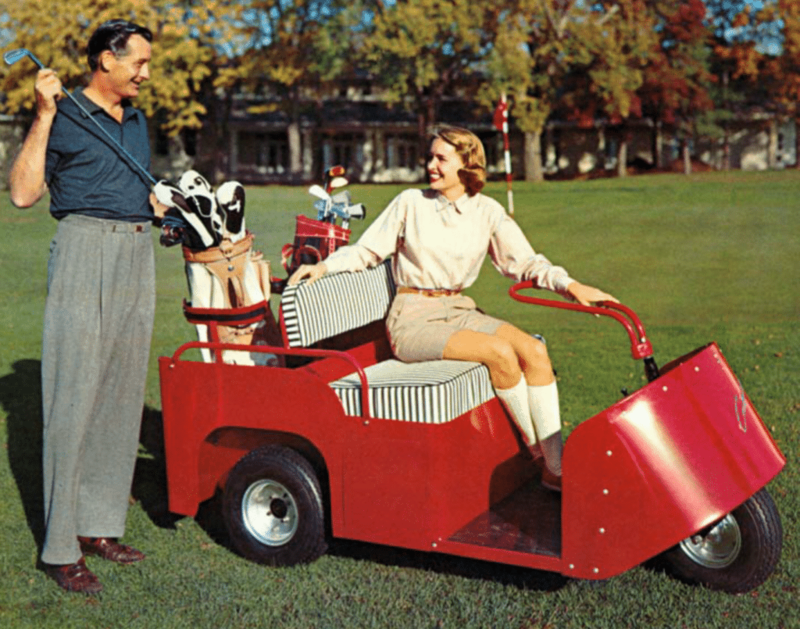 In 1950 Cushman introduced their first three-wheel golf cart called the Golf Buggy. This was essentially a modified Model 60, powered by a scooter engine. Cushman began assigning Series numbers in 1953, beginning with the Truckster. In 1958 Cushman transitioned to 36 volts. In 1961 Cushman closed down a factory they had and converted it over to aluminum die casting. This is where they built the first 18 hp engines that went into the “Shark Nosed” series 735 golf cart. Cushman produced the series 736 Scotsman model 881009 from around 1964 to 1968. This model came with an 8 HP Kohler engine. In 1969 the Scotsman model 898105 was introduced and came with a 5 HP, 14.1 cubic inches, four-cycle Briggs and Stratton engine. From 1965 through 1967 Sears offered a rebranded series 736 with the 5 HP engine. The Sears model number was 809.656750. In 1968 Sears sold the cart with a 6 HP engine, model number 809.656751. 1970 was the last year for the Scotsman model. The Town and Fairway model was also introduced in 1968 and sported a 4-seater with the 3rd and 4th seat facing backward. This version came in either 36 volt electric or with a 10hp Kohler K241 engine. From 1974 to 1975, the Combo 1 version of the Town and Fairway was produced which featured the ability to fold down the back passenger seat for golf bags. There were only 200-300 of these built. From 1972 through 1975 only the 4-wheel cart was constructed. Cushman pretty much dominated the field with their line of golf carts but got a two-punch from Harley Davidson coming out with their gas golf cart and an influx of underpriced EzGo knockoffs made by Melex in Poland. 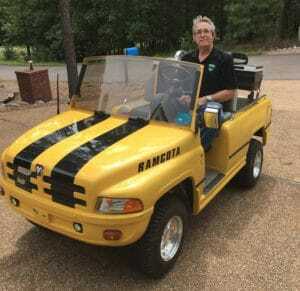 Management decided to leave the golf cart market and concentrate on building industrial vehicles. Ransomes Ltd. purchased Cushman by in 1989, and Ransomes was in turn acquired in 1998 by Textron, owners of EzGo. 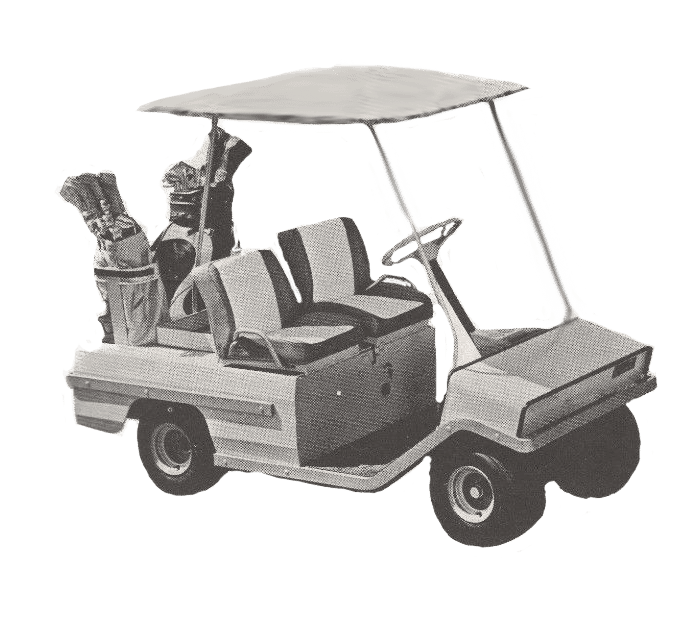 All golf cart production ceased on June 27, 1975. I would love to see it. Send any pics you have to unclejohnnybgood@gmail.com and we will try to track it down. I see that it’s a 1960 36Volt Golfster by the number…The manual you need is PU33-000 available at https://www.vintagegolfcartparts.com/Item/CU_PrtsManual1 for $19.78. I don’t have that one yet, so I don’t have the electrical diagrams to post. And yes, there are some differences in the wiring (routing, wire color, etc) but the parts are mostly the same. I sent you an email with the closest match I have for that year…If that is a Kohler engine the number points to a ’77. Maybe it was replaced? I have an old 4 wheel cushman electric cart. 36 volt. I think it’s from the late 60s or in the 70s. I’m sure it’s a royal. I cannot find the model number. It has a big R on the front. It has a single leaf spring for the front suspension with a big u shape stabalizer bar. I need the round cover that goes over where the shift lever connects to the forward and reverse control box. It is about 7 to 8 inches round. On a vehicle that age, you are probably going to have to fabricate a replacement, or find a donor vehicle. Send a picture of the vehicle and I will ask around. The serial number will tell you what you have, and you can determine the condition it is in for it’s age. I have what I think is a 1967 Cushman Scotsman golf cart with a bad engine that I am taking offers on. The model number is 736-678250. That model number translates to a 64-65 Scotsman. 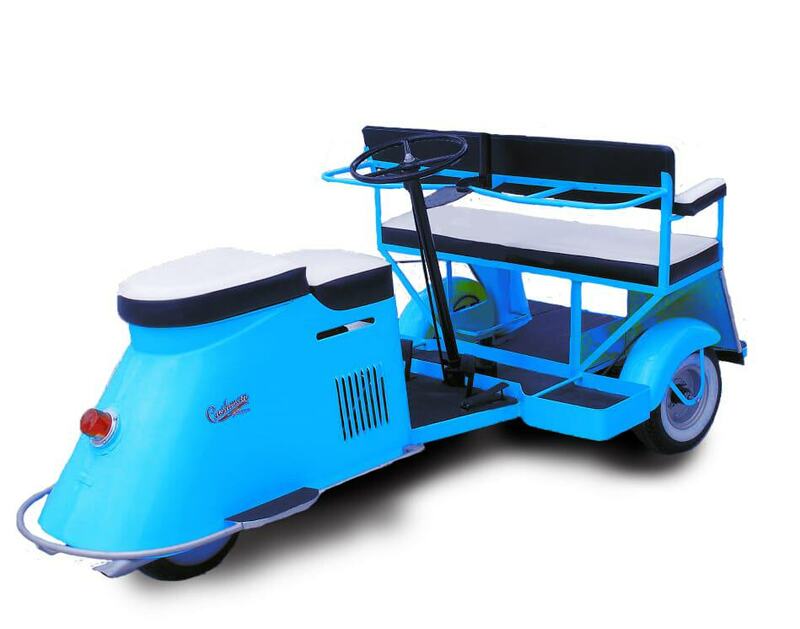 I just bought a 4 seat cushman serial # 898201 uLLo …. im not sure of year ? The 898201 is the Town & Fairway model, and the next four digits (like 7110) indicate the year, so in this case, a 7110 would be 1971.